Some of you may be wondering where my brain is at, with all of these interesting ingredient combinations throughout my Whole30 experience! Well, this recipe is not going to be any different. I love sweet potatoes and can’t think of anything else I’d love to have for breakfast (and lunch and dinner … but then I may just get too sick of having the same thing over and over again!). Just look at the recipes where I use sweet potato – Sweet potato and veggie soup, Sweet potato toast, Veggie spaghetti, Roast veggie and quinoa salad just to name a few! 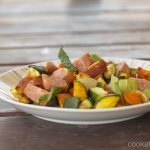 And then I’ve been searching for new and awesome recipes that are Whole30 compliant and I kept coming up with hash recipes. 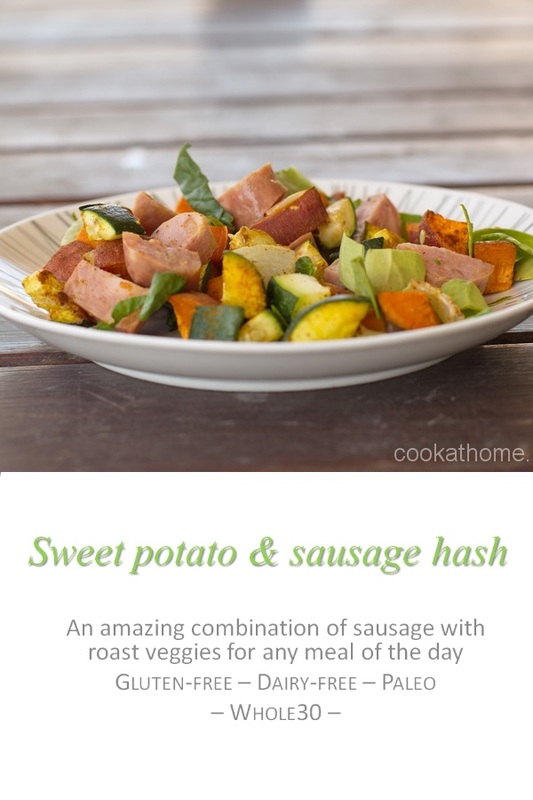 I really didn’t know what a hash was – my mum used to make a meal called ‘mish-mash’ where she took all the leftover meat and veggies and cooked them all up together so there never was a constant recipe – I’m thinking a hash is something similar. I’ve based this sweet potato and sausage hash off another recipe from Paleo Running Momma (original recipe here), which included apples and bacon. I was originally going to do this exactly, but then didn’t feel like having apples again, and I haven’t found any bacon that doesn’t contain sugar, so I made it up as I went along. The first time I had this hash, I put a poached egg on top, but that actually made me feel so full. It was a good feeling of full and it seriously kept me going until lunch time, but since then I’m quite happy with the hash as it is! This is so awesome, you just have to try it! Turn oven on at 350F and prepare a baking sheet with parchment paper. 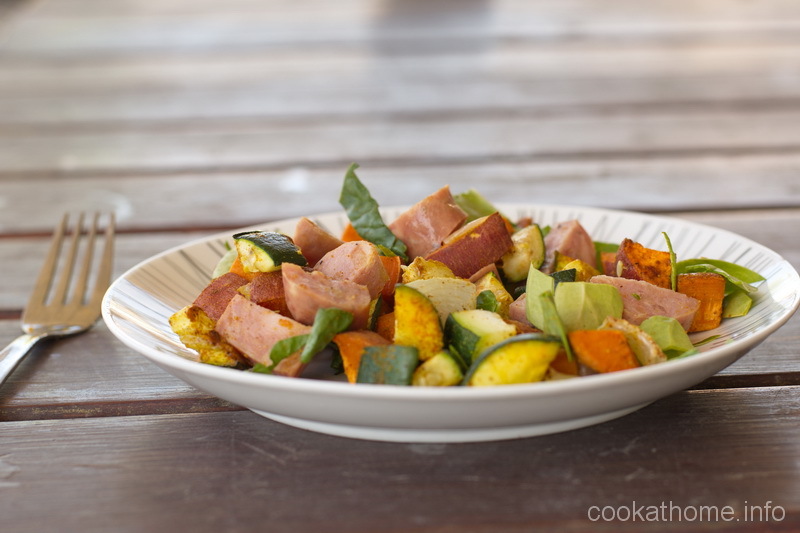 Place the sweet potato and zucchini on the baking sheet and sprinkle paprika and cumin on top. Mix together with your hands to ensure all veggies are coated with the spices. Roast for 30-35 minutes, or until the sweet potato is tender. In a separate frying pan, saute the onion with the garlic until the onion is soft. Add the sausage pieces and fry until cooked through. Add the sweet potato and zucchini to the frying pan and toss until heated through. At the last moment, add the spinach and allow to wilt.